Proposed changes to the Access to Information Act do not address a key way that the federal government thwarts the public’s right to know. The federal government has revealed the reforms it plans to make to the Access to Information Act (ATIA). I had hoped to see proposals for how the public’s interest in unfettered scientific communications would be protected in law. Unfortunately, there are none. Comment from the Information Commissioner is needed. Members of Parliament should also raise their concerns in Question Period and during debate. Yet federal ozone research is in a highly precarious position, with global implications. The Toronto Star’s Kate Allen has posted a wonderful story about the invention of the UV index. The index – which raised awareness around the world about the need to use sunscreen and hats to prevent skin damage from UV exposure – turned 25 years old on Saturday. It is a story of outstanding Canadian innovation that later devolved into one of the Harper government’s greatest debacles. In this article I provide some additional details in support of Allen’s story. My notes from Chapter 2 of Canada’s Fundamental Science Review. Chapter 2 of Canada’s Fundamental Science Review makes the case for discovery science. There are no recommendations emerging from this chapter. Instead, it is argued that social, health, and economic benefits accrue from the pursuit of basic knowledge. There are a few choice quotes along the way that bring the issues into focus. There is an important problem, however, that I think the panel has overlooked. My notes from Chapter 1 of Canada’s Fundamental Science Review. I am now starting to delve into the details of Canada’s Fundamental Science Review. Chapter 1, titled “Canada’s Science and Innovation Ecosystem”, describes the Review panel’s mandate. Of particular interest is Exhibit 1.2 (reproduced here) which identifies the granting agencies and programs of specific interest. This leads into a discussion of the damage being done by Innovation programs to discovery science. Any damage from Chairs programs, on the other hand, is overlooked. More on that shortly. The problems plaguing basic science in Canada are exposed in surprisingly blunt language. The federal panel reviewing fundamental science in Canada published its final report on 10 April 2017. Below are my notes from the Abstract and Executive Summary, taken in the days following the report’s release. The full document is 280 pages in length, and I expect to delve into the details shortly. My first impression is that the panel has produced an excellent report that exposes the problems plaguing basic science in Canada in surprisingly blunt language. Several colleagues that I have spoken with share this assessment. Information access laws should be reformed to protect the public’s interest in unmuzzled science. The Trudeau government has made good progress on their promise to unmuzzle federal scientists. One of their first acts was to eliminate Harper government policies that enabled muzzling. Last December, they also agreed to contract language with PIPSC, the union that represents federal scientists, to formalize scientists’ right to speak publicly about their research. These were important steps forward for which the federal government should be commended. While the new agreement protects scientists from being silenced, it does not defend the public from political interference in scientific communications. This issue has not receded – as I shall explain – despite the dispatch of the Harper government in 2015. Legislative action is needed, and in this post I argue for changes to the Access to Information Act. Canada’s $3B+ annual giveaway could be put to better use. 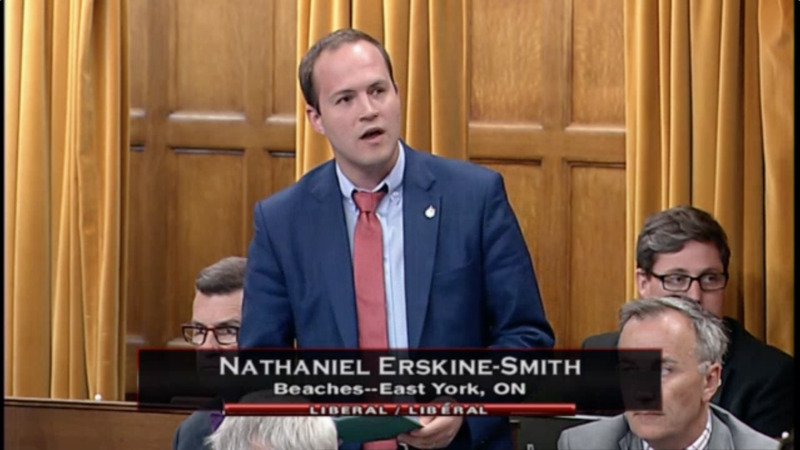 In yesterday’s post, I challenged the federal Liberal government to make good on its promise to eliminate fossil fuel subsidies in the medium term, consistent with Canada’s G7 commitment. These subsidies won’t go away overnight. Medium-term elimination requires short-term progress. Hundreds of millions of dollars could be freed up for current priorities. The sooner Canadians can openly admit the sun is setting on the oilsands, the sooner the energy industry will reorient itself toward Canada’s future needs. Two years ago Liberal leader Justin Trudeau was advocating both for the expansion of pipeline networks and the need to fight climate change. It made little sense then, but Prime Minister Trudeau has persisted in trying to have it both ways. In mid-November, the federal Liberal government announced plans to eliminate coal-fired power plants by 2030, following its October proposal for an economy-wide price on carbon. These are both important and necessary steps. If Canada is to fight climate change, then gradually eliminating our use of fossil fuels is essential. Pricing carbon has long been viewed as an important economic tool to encourage the transition to zero-carbon energy sources. NOAA’s State of the Climate in 2015 shows that climate change is all around us. On Wednesday I spoke with CBC Radio One’s Bob Murphy about NOAA’s State of the Climate in 2015 report. The report is a real eye-opener, painting 2015 as a year of climate records. At least one of those records has already been broken this year. The report has roughly 470 international authors and editors, and weighs in at 300 pages cover-to-cover. It was published by the American Meteorological Society after peer review. Let’s have a look at some of the highlights. Public Accounts data reveal periods of expansion and contraction in spending on environmental science, monitoring and protection. For the past few weeks I have been examining Canada’s Public Accounts as published by the Receiver General in an effort to understand the long-term evolution of Environment Canada’s budget. Records are provided online back to 1995, and Dalhousie’s Killam Library has hard copies for earlier years. The data reveal historic periods of expansion and contraction, with cutbacks during the Chrétien years rivaling those of the Harper government. Update: EC’s budget is not declining as their published numbers had me believe. Update - 14 July 2016: An indirect communication to me from the Trudeau government indicated surprise that Environment Canada’s budget was decreasing and suggested that my “Planned Spending” numbers – obtained from EC’s Report on Plans and Priorities 2016-2017 (see here) – are wrong. Further investigation reveals that EC’s budget is not declining as their published numbers had me believe. The Toronto Star should either produce an expert who supports their interpretation or admit that it got this one wrong. The allegation is based on their interpretation of a Treasury Board document obtained through access to information legislation. It is not supported by any expert analysis, and my own interpretation – based on experiences in working on muzzling and other issues plaguing federal science – is quite different. The Star asserts that their story was “accurate” and “reported fairly and responsibly”. It led to the public shaming of a civil servant in their Letters pages. I am not convinced by The Star’s response, and break it down below. Their position permits considerable license to reporters to interpret – and sensationalize – the facts. An award-winning atmospheric scientist says his work “could not have been accomplished under the kind of science management that has emerged”. The highest honour for an Atmospheric Scientist in Canada is the Patterson Medal for distinguished service to Meteorology. The most recent winner, named at this past May’s CMOS Congress, was Prof. C. Thomas McElroy from York University. McElroy has had a long and celebrated career in Atmospheric Science. For years he was a Senior Scientist at Environment Canada in the Ozone Group, where he co-invented the UV Index and the Brewer Spectrophotometer. The UV Index is used worldwide to alert the public to the dangers of UV exposure, and the Brewer is used in more than 40 countries around the world to monitor the ozone layer. The present system of unchecked managerialism undoubtedly is a drag on scientific progress. Having distinguished scientists like McElroy step up to remind us that there is a better way is helpful. I emailed Prof. McElroy and he kindly sent me a copy of his speech. The full text is reproduced below (with permission). My complaint that they misinformed readers was politely, but firmly, rebuffed. I obtained the documents and found that they said no such thing. Following a few initial queries, I submitted a formal complaint on 16 May. Kathy English, The Star’s Public Editor, responded the next day. The Star disagrees with my assessment. The text of Mrs. English’s reply is reproduced below (with permission). My formal complaint is given at the end. An article in the Toronto Star has seriously misinformed readers, provoking unwarranted attacks on a federal bureaucrat. The public servant in question was named, provoking angry letters from readers arguing that scientists must be allowed to speak. I have been cc’d on emails to the Prime Minister arguing that she should be fired. These were not unreasonable responses given what was reported. Unfortunately, the claim was false, and potentially libellous. It is much as I feared when I first read the article. I obtained a copy of the document in question, and find it does not support the journalist’s contention. Read it and see for yourself. Progress on behalf of our beleaguered federal scientists has been made, but more is needed. There are new developments in the case of muzzled federal scientists. A report indicates that the practice of muzzling has continued at Health Canada. Another story indicates that the Treasury Board wants to keep scientists on a “tight leash”, but I do not find this claim convincing. I also emailed the Office of the Information Commissioner to inquire about their ongoing investigation into muzzling. Details below. A new report moves forward the conversation on how to deal with bad actors in the fossil fuel industry. Dalhousie University has released the Final Report of the Ad Hoc Committee of Senate on Fossil Fuel Divestment. I was one of six members of the Committee, and we reported our findings to Senate on March 14. See CBC’s coverage here. Divestment from fossil fuels was initially proposed by campus group Divest Dal as a way for Dalhousie University to help in the fight against climate change. While Dalhousie’s Board of Governors rejected their proposal, it spurred Senate to form a committee to further investigate the issue. The Committee was charged with canvassing the community for input on the risks and opportunities posed by divestment, and with preparing an analysis. The report is the product of that effort. The Vancouver Declaration is an important step forward in Canada’s efforts to reduce greenhouse gas emissions. Prime Minster Trudeau met with Canada’s premiers on March 3. The meeting kick-started a process to create a national framework to combat climate change. It was held 82 days after the international Paris Agreement was completed, and thus fulfills a pledge made by the federal Liberals in their election platform. I am encouraged by the result, as formalized in the Vancouver Declaration. The Prime Minister and premiers jointly recognized the reality of climate change and made firm commitments for action with timelines. The commitments are measurable and represent important steps forward. We need to insist that every Premier follows through in a timely manner, and hold their feet to the fire if it looks like they aren’t going to live up to their commitments. There are a few causes for concern, including what appears to be a pipeline loophole. I will list these issues at the end, in the hope that they will be addressed. But first, let’s review the many positive aspects of what was agreed in Vancouver. It’s not the disaster you may think it is. I recently attended a meeting of environmentalists interested in climate and energy issues. In one of the introductory talks, a speaker stated categorically that “nuclear power is a disaster”. I argued that this is not supported by evidence, and was rebuked by some in the audience. I wasn’t given a chance to respond, but will do so here because I think that this is an important issue that society needs to grapple with. Climate change is the greatest long term threat to humanity. The death toll from global warming is already in the hundreds of thousands every year. Fossil fuel emissions must peak this decade if we are to limit global warming to 1.5°C as per the Paris agreement. The need to address global warming is urgent, and all options for reducing greenhouse gas emissions – including nuclear power – must be on the table. The Intergovernmental Panel on Climate Change (IPCC) was clear on this point in its most recent assessment. That being said, nuclear power is not a silver bullet for solving the climate problem. Opponents will rightly point out that wind power is less expensive, and that there is now more wind capacity installed worldwide than there is nuclear. I will try to convince you that continued use and refurbishment of existing nuclear power plants can make good economic and environmental sense. The Paris Agreement limiting global warming to 1.5°C should mean an end to new pipelines, oilsands expansion. The nations of the world agreed in Paris (December, 2015) to pursue efforts to limit global warming to 1.5°C. Canada pushed hard for the 1.5°C target, which will require gradually eliminating greenhouse gas emissions worldwide. The target has significant implications for both the production and consumption of fossil fuels. In this post I review some important findings from science and discuss the implications for domestic policy. I find that if Canada is to do its part to fight climate change, then we likely cannot build new pipelines nor further expand Alberta’s oilsands. Greenhouse gas emitters like Canada really do matter. The Harper regime regularly defended their climate policies by pointing out that Canada contributes “less than two percent” to global greenhouse gas emissions. The assertion was made regularly in parliament (see here, here, here and here) and in public (here and here). Notably, former Environment Minister Peter Kent used the line in defending Canada’s withdrawal from the Kyoto Protocol. The defence bothers me not because it is false (it is, in fact, true), but because of the implication that two percent is somehow unimportant. The communications policy for EC brought in under the Harper regime is no longer in effect. When we first heard on 6 November 2015 that scientists at Environment Canada (EC) and Department of Fisheries and Oceans Canada (DFO) had been unmuzzled, I was at once both elated and concerned. Freeing federal scientists from the shackles of the Harper regime was one of the promises of the new federal government. But could they really make good on that promise so quickly? It is one thing to say that scientists are unmuzzled, and quite another to dismantle the policies (e.g., the EC media protocol) that allowed it. Furthermore, if those policies remained in place, then any scientist who spoke without authorization could end up in a pile of trouble. With the Paris climate agreement finalized, attention will now shift to its implementation. On Wednesday I spoke with Stephanie Domet on CBC Mainstreet about the new Paris Agreement on climate change. In discussions before my spot, Mainstreet’s producer asked “What can you tell me about the Agreement that hasn’t already been said?” After a little thought, there was something: It is not widely known, but the federal government already has plans for greenhouse gas (GHG) reductions (and I’m not talking about the past government’s failed sector-by-sector approach). The government’s plans will create opportunities for Canadians, including Nova Scotians. First, the nuts and bolts of the Agreement. A forum is planned, and further input is requested. Today, Dalhousie University released the Preliminary Report of the Ad hoc Committee of Senate on Fossil Fuel Divestment. The draft was presented to Senate on Monday. A good summary of the presentation, including some background, is provided at Halifax Media Coop. The draft is released on the heels of a similar effort at University of Toronto. The Committee, which consists of six representatives from across the University, including myself, was charged with investigating and critically analyzing the opportunities and risks of fossil fuel divestment to Dalhousie’s academic units. We canvassed for input, and received submissions from faculties, departments, groups and individuals. Divestment is a contentious issue. It is accepted that the burning of fossil fuels is driving climate change, with implications for food and water security, biodiversity and more. There are, however, varied opinions on how greenhouse gas emissions should be reduced, and whether or not divestment will help. The complexity of the issues was rightly reflected by the input we received. We carefully studied the submissions and extracted a potential consensus position. Last week’s call by Ecojustice and friends for an investigation of climate change denier groups was covered by National Observer, Edmonton Journal and Vice. Friends of Science wrote a response, as did ICSC Director Tom Harris in comments on DeSmog. And I got twitterbombed! False representations made by denier groups have misled Canadians about climate change and may violate the Competition Act. Today, Ecojustice lawyer Charles Hatt filed an application with the Competition Commissioner to investigate false and misleading representations made by climate change denier groups. I am one of six applicants, which include Stephen Lewis, Tzeporah Berman, David Schindler, Danny Harvey and Devon Page. A press release from Ecojustice is available here. The application alleges that the denier groups have furthered their business interests and those of their sponsors by misleading the public about the reality, causes, and consequences of climate change. The Competition Act holds that such misrepresentations are illegal. Advertisers may not spread falsehoods. How do scientists know that carbon dioxide emissions are responsible for global warming? Here is a short explanation. In light of the current climate negotiations in Paris, I thought it might be interesting to provide a (reasonably) simple explanation of how we know global warming is driven by greenhouse gas emissions. The science has been developed for over a hundred years, and is now understood in considerable detail. I will begin by showing graphs of atmospheric greenhouse gas concentrations and global temperatures, and then proceed to describe how the changes in each are connected. The final plot reveals the differences we would expect if greenhouse gas concentrations were held constant. It is a crucial plot that underscores why scientists are so confident in their assessment of global warming. Canada should be fighting for, not against, a legally-binding agreement with meaningful greenhouse gas emissions targets. Climate negotiations in Paris are underway. Prime Minister Justin Trudeau began the conference by announcing “Canada is back”, then adding there “can be no laggards” in the fight to reduce greenhouse gas emissions. These are fine things to say, but contrasting messages on substantive issues are coming from Environment Minister Catherine McKenna. This is cause for concern. “Sunny ways” are no substitute for greenhouse gas emissions targets. The posture of the new Liberal government heading into next week’s climate negotiations in Paris is very welcome. Gone is the antagonistic approach of the Harper regime. Prime Minister Trudeau will be attending himself, along with a gaggle of premiers, ministers and others in the Canadian delegation. But optimism over the federal government’s “sunny ways” should not blind Canadians to worrisome signs. Federal scientists are specifically employed to provide impartial advice and protect the public interest. Yesterday’s post provides a fine example of how difficult it can be to identify scientific consensus. While some neurologists have vehemently opposed the CCSVI-MS hypothesis, others with relevant expertise have been less sure. This poses a problem. How can governments act in a manner consistent with the principles of evidence-based decision making while scientific debate continues? To whom should they turn for advice? Minister Kirsty Duncan was unfairly criticized in National Post for her work on behalf of MS sufferers. Canada’s new Minister of Science is Kirsty Duncan, Liberal Member of Parliament (MP) for Etobicoke North. The position is formally designated as a Minister of State “to assist the Minister of Industry in the carrying out of that Minister’s responsibilities”. Many in the science community have welcomed Duncan’s appointment. Her background is in medical geography, and before entering politics she was a professor at the universities of Windsor and Toronto. Are these charges fair? A “clash” with other academics nearly two decades ago hardly seems relevant, while anyone who supposes politics is absent from science has clearly never worked at a university. The concerns about Duncan’s promotion of an “unproven medical treatment,” however, are much more substantive. In particular, McGill University neurologist Michael Rasminsky labeled the ideas Duncan supported as “profoundly non-scientific”. Is he right? If Duncan was a promoter of pseudoscience then her appointment as Science Minister would indeed be problematic. The Liberal Party’s platform outlines many positive initiatives for science and the environment. Their good intentions need to be translated into good policy. I had a nice discussion on Friday with Stephanie Domet/CBC Mainstreet Halifax about what the new federal government could mean for science and the environment (also see CBC News). I expressed “cautious optimism” as a result of several encouraging proposals outlined in the Liberal Party’s election platform. Caution, nevertheless, is warranted. I have said for some time that ridding ourselves of the Harper government is a “necessary but not sufficient condition” for progress on science and the environment. The good intentions expressed in the Liberal plan now need to be translated into good policy. Below I discuss their full platform and supporting documents. Rather than reviewing the general principles outlined in their plan, I have catalogued – in five subsections – specific proposals against which we can measure the new government’s actions. MPs who executed the Harper government’s War on Science were largely rejected by voters in election 2015. The Harper government is behind us at last. What role did the War on Science play in its ouster? It is hard to say, but note this: besides Stephen Harper, only two prominent executors of the War survived the purge. Peter Kent, the man regarded as Canada’s worst-ever Environment Minister, was re-elected, as was the MP who most often defended the muzzling of federal scientists, Minister of State for Western Economic Diversification (and former Environment Secretary) Michelle Rempel. Postmedia has outdone itself – and the Globe & Mail – with its Harper boosterism. I didn’t think that any newspaper could eclipse the Globe & Mail’s silly endorsement of the Conservatives while simultaneously calling for Stephen Harper’s resignation. But the Postmedia chain has accomplished this stunning feat. After its papers (Vancouver Sun, Ottawa Citizen, and others) endorsed the Harper Conservatives, many ran full front-page ads warning “Voting Liberal will cost you”. Andrew Coyne subsequently resigned as National Post’s Comments editor when they declined to print his dissenting opinion. Postmedia has not only blurred the lines between informed opinion and paid advertising; they have muzzled one of their most influential columnists. In insisting that its papers toe the line, Postmedia has brought the credibility and integrity of its whole chain into question. They have also reminded us once again why the concentration of media properties into the hands of a few is a bad idea. The Globe & Mail has demonstrated convincingly why political endorsements should be abandoned as a thing of the past. I have to feel a little bit sad and embarrassed for the Globe & Mail. Their endorsement of the Conservatives for federal re-election while calling for Stephen Harper’s resignation has been rightly met with ridicule. That they somehow suppose the sycophants and yes-men left behind can run the country better than anyone else shows a surprising lack of imagination from our paper of record. This is not the first time a Globe & Mail endorsement has raised eyebrows. Their support for Stephen Harper’s government in 2011 as “moderate and pragmatic” ignored ample evidence to the contrary that compounded over the next four years. Their backing of Tim Hudak for premier of Ontario – he who promised to fire 100,000 government workers and create 1,000,000 new private sector jobs – after calling his party “barely” viable, was peculiar to say the least. It later emerged that their Editorial Board’s decision to endorse a minority Liberal government was overruled at the last second by Editor-in-Chief David Walmsley. This begs the question: Why do news media endorse political parties? Newspapers should be holding truth to power, not acting as king-makers. Is the public well-served by endorsements? Are they better informed? Anyone following the Globe & Mail over the past few years would surely conclude not. Two McGill academics throw cold water on the idea that the Harper government is engaged in a War on Science. Here is why they are wrong. The Canadian Journal of Communications has recently published a “preliminary version” of a paper entitled Getting it Right: Canadian Conservatives and the “War on Science” by Elyse Amend and Darin Barney. In the accompanying editorial, Michael Dorland states that he is making the paper – which is, in his view, “a timely and outstanding account of a hot topic, written with the calm of the very best policy scholarship” – available early “in the interests of democratic debate… to time it with the remaining days of the electoral discussion”. We agree that the War on Science is – or rather, should be – an important election issue. We are less certain, however, about the quality of the scholarship. Will Harper Gut the Species at Risk Act Next? Letters from CAPP to the federal environment ministers expose oil industry efforts to undermine SARA. In an earlier post I showed how the oil industry lobbied the federal government to rewrite Canada’s environmental protection laws using omnibus legislation. They got everything they asked for and more in the omnibus budget bill of March 2012. Emboldened by their success, the Canadian Association of Petroleum Producers (CAPP) has continued to lobby for changes to the Species at Risk Act (SARA). There is considerable danger that SARA will be next in line for dismantling should Stephen Harper’s Conservatives win re-election. Former Environment Minister Peter Kent was widely quoted in September 2012 as saying SARA would be reformed. In particular, he said that the Act would need to be made more “efficient” and “effective”. Where did Kent get his ideas? There is a large gap between our greenhouse gas emissions commitments and our efforts to achieve them. One of Stephen Harper’s enduring legacies will be his government’s perpetual climate charade. Canada has long been challenged by the need to reduce greenhouse gas emissions. To illustrate the gap between our actions and words, I put together this graph. As shown, Canada’s greenhouse gas emissions rose dramatically from 1990 through 2007. Emissions briefly declined owing to the global recession, but are now expected to rise through 2020 because of growth in the oilsands sector. These data are from the government’s own Emissions Trends 2014. Our targets are being missed by a wide margin, a problem that spans multiple majority and minority governments. The Kyoto commitment was made by the Liberal government of Jean Chrétien, and the Copenhagen commitment was made by the Conservative government of Stephen Harper. The 2030 commitment is what the Harper government submitted to the UN in advance of December’s Paris conference on climate change. Why aren’t we meeting our commitments? The main problem is the gap between targets and policies. Any fool can announce a target. Designing and implementing policies to meet them is another matter entirely. Rather than burning books, our federal government simply threw them in the dump. This page summarizes what we know about the closure of Canadian federal science libraries and the destruction of their collections. If you would like to help or have information to share, please contact me at tomduck@tomduck.ca. To-do items are listed in footnotes. Beginning in 2012, federal science libraries across Canada have been closed and their collections “culled” – Harper government newspeak for “thrown in the trash”. Scientists on the scene have called the closures “chaotic”, “carried out in great haste”, a “national tragedy”, and a “libricide” akin to a “book burning”. They have also pointed out the government’s spin on the situation simply “doesn’t add up”. Instead of debating the Harper government’s record, we are being distracted by a message of hate. It is completely maddening. Canada stands at a turning point in its history. We face unprecedented challenges – from climate change to a deteriorating democracy – that we should be debating during this interminable election campaign. Yet rather than examine the Harper government’s record, our political leaders are arguing about niqabs. Niqabs! For the past seven weeks I have been counting down #50ReasonsToDumpHarper and examining the Harper government’s “decade of scandals”. Prime Minister Stephen Harper is dismantling Canada brick by brick, and it has to stop. The list of reasons is given below. Please share this far and wide. Scott Findlay’s essay “Governing in the Dark” explains what it means to be a scientist-advocate. At last Tuesday’s Get Science Right town hall I used the phrase “governing in the dark”. You may have heard it before. The concept was introduced and developed by University of Ottawa professor Scott Findlay in an op-ed, lecture and essay. All three articulate his concerns for the state of Canadian science and democracy. Documents reveal the oil industry pushed for changes to Canada’s environmental laws and even proposed the Harper government’s omnibus strategy. I have noted before that the oil industry lobbied for the sweeping changes made to Canada’s environmental laws (see here and here). In this post I share the supporting evidence. Let me preface my remarks by saying this: Although the oil industry can ask for whatever it wants, our government has a responsibility to protect the public interest. Unfortunately, the Harper government followed through on the oil industry’s demands by gutting Canada’s environmental protection regime with their 420-page Jobs, Growth and Long-term Prosperity Act (Bill C-38) of 2012. There is good cause to believe our federal government has been captured by oil interests. Despite everything that has gone wrong, the passion for science in Canada remains unbroken. What an amazing success. Tuesday’s Get Science Right town hall in Halifax’s Central Library was packed with an estimated 200 attendees. The event’s proceedings have been covered by Halifax Media Coop, and an interview with the panelists was published by Chronicle-Herald. CAUT, DFA and ANSUT sponsored the event, and I thank Donna Balkan (DFA) and Matthew Furlong (ANSUT) for organizing it. The agreed GHG reduction target for developed nations is supported by evidence from science. You may have noticed in an earlier post that developed nations are targeting an 80% reduction in greenhouse gases (GHGs) by 2050 relative to 1990 levels. Where did this number come from? It turns out to be a generally agreed policy that is supported by evidence from science. So much has gone wrong for science over the past decade. Let’s debate how to get it right in the next. Halifax’s Get Science Right town hall is tonight. It has been in the news: Andrea Gunn wrote an excellent overview for the Chronicle-Herald, and CBC Information Morning interviewed me about it. I have already posted a backgrounder about what to expect. The event will be structured somewhat differently from last time. We will begin with four short presentations from our panelists, to be followed by an open public discussion. This just in: Evidence for Democracy (E4D) released the results of its questionnaire on science that it sent to all of our political parties. I expect that Katie Gibbs – E4D’s director and one of tonight’s panelists – will want to talk about it. Please join us to debate the way forward on science and evidence-based policy-making in Canada. Some parties are taking the Paris climate negotiations seriously, others not so much. Whomever forms the next Canadian federal government is going to have to hit the ground running on climate change. A new international agreement on greenhouse gas emissions (GHGs) will be struck only six weeks after the election. US President Barack Obama has readied the US. How prepared are Canada’s political parties for the coming negotiations? Calgary MP Michelle Rempel has repeatedly misled the public and Parliament about the muzzling of federal scientists. I have uncovered more evidence that Prime Minister Stephen Harper’s MPs are misleading the public and Parliament about muzzled federal scientists. I have already written about (former) Environment Minister Peter Kent’s false statements. Here, I examine claims by Calgary MP Michelle Rempel. Rempel is Harper’s point person for defending his government’s muzzling program. She has repeatedly said that Environment Canada (EC) scientists conduct “thousands” of interviews with the media. Scott Findlay has already pointed out that this defence is specious. But documents show it is even worse than that. A comprehensive list including links to their research and evidence they were silenced. My recent essay in the Tyee deconstructed the Harper government’s muzzling of federal scientists. It exposed the policies that facilitate muzzling and explained how they are applied. Below is a comprehensive list of silenced scientists as reported in the media. I will add to it as new incidents are uncovered. Please join us for a panel discussion and public debate on the role of science and evidence in Canada. A Get Science Right town hall will be held next Tuesday at Halifax Central Library – please see our event page on facebook. Our purpose is to discuss the plight of science and evidence-based policy-making in Canada. A panel discussion will set the stage for what I expect will be a lively discussion. Read on for more about our panelists and their efforts to raise awareness about public-interest science in Canada. This might explain why progress on reducing greenhouse gas emissions has been so difficult to achieve. My article on Muzzled Scientists stated “several MPs and senators have questioned the scientific legitimacy of climate change.” Here is evidence in support of that statement. I will update this rogues’ gallery as other cases are uncovered. Annan’s report to the Millennium Assembly of the United Nations cited sustainability as a key challenge. Getting rid of the Harper government is a necessary but not sufficient condition for restoring the health of the federal Public Service. Chris Turner, author of The War on Science, has a new op-ed posted in The Toronto Star titled “Stephen Harper’s war on experts”. Turner knows his stuff – his 2013 book is excellent – and the new op-ed doesn’t disappoint. He covers the myriad ways in which the Harper government has acted to diminish input from experts, with particular focus on the cancellation of the long-form census and the 2012 omnibus budget bill. (emphasis mine). This seems unlikely to me for two reasons. 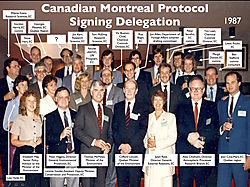 Canada’s 1987 Montreal Protocol signing delegation featured politicians, policy-makers and scientists. And to go along with it I have a special surprise: an annotated photo from 1987 of the Protocol’s Canadian signing delegation. The photo features Progressive Conservative Thomas McMillan (Minister of the Environment) and his Senior Policy Advisor Elizabeth May. Yes, current federal Green Party leader Elizabeth May. The photo is notable in that it includes federal scientists. Unlike today, federal scientists were not muzzled, and were depended upon to inform evidence-based policy-making. Imagine that. There is one name missing from the photo. Please email me if you know who it is. There is a mountain of evidence that federal scientists are being muzzled; it’s time to finally do something about it. My essay on the muzzling of Canada’s beleaguered federal scientists is now posted on The Tyee, and is currently the headline item on their front page. The Tyee is an award-winning site that publishes news, reviews and commentary not typically covered by mainstream media. I comprehensively deconstruct the Harper government’s muzzling program. Evidence for widespread silencing of scientists is provided, and the policy changes that brought it about are described. I discuss how Parliament was misled, and how muzzling benefitted the government’s program of cuts and environmental legislative changes – with connections to the oil industry. The piece wraps up with a commentary on the role of federal science in society and the impact of muzzling on democracy. My purpose in writing the piece is to provide a reference document for future work. There are around 60 links to background and source documents. Some of the original links had to be culled, and I will post the important ones in the coming days. Mary Lynk’s documentary on the fraught relationship between science and power is superb. CBC Radio IDEAS will re-broadcast Mary Lynk’s three-part series “Science Under Siege” later this month (details below). The show features a compelling cast, including biologist Jeff Hutchings, science historian Ian Stewart, and Evidence for Democracy director Katie Gibbs. It explores the often fraught relationship between science and power, both today and historically.